We made 20 dozen in a day-long baking and frosting marathon. I like the grumpy snowman. :) Funny, I did the decorating on very similar coookies at my dad's last friday. Maddness. Different frosting though- smooth, powdered sugar, egg white and milk. looks like fun, though. 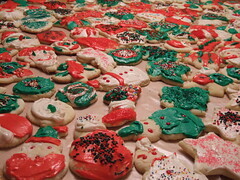 I miss making/decorating cookies. Now that's what I would call a fuckton of cookies.